A square with area 4 is inscribed in a square with area 5, with one vertex of the smaller square on each side of the larger square. A vertex of the smaller square divides a side of the larger square into two segments, one of length , and the other of length . What is the value of ? Since this is an AMC 8 problem, I probably did this before. Anyway, it seems quite straight-forward. 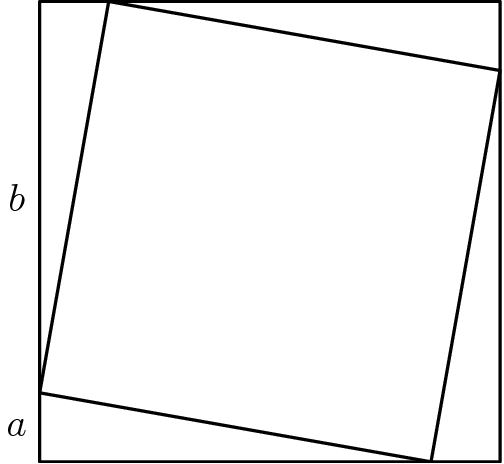 The bigger square has an area of , so it must have a side length of . Therefore, . Subtracting from that equation, we get , so . Therefore, The answer is C. Let’s see if we’re . Oh man. We’re right, of course, but there’s an easier way to do the problem. According to the solution, the area of one of the small right triangles is . Therefore, . So apparently, I was kind of outsmarted by an AMC 8 problem. Quite the shame. This only took about 20 minutes to write, and it’s just a filler problem. I will definitely make a post tomorrow, though!